Mueller did not make a conclusion on whether Trump, whose presidency has been overshadowed by the Russia investigation, had committed obstruction of justice but did not exonerate him either. The report provided fresh details of how the Republican president tried to force Mueller`s ouster, directed members of his administration to publicly vouch for his innocence and dangled a pardon to a former aide to try to prevent him from cooperating with the special counsel. It also concluded, as Barr announced last month, that Trump and his campaign had not engaged in a criminal conspiracy with Russia during the election. Barr in March concluded that Trump had not broken the law, but told a news conference on Thursday that Mueller had detailed "10 episodes involving the president and discusses potential legal theories for connecting these actions to elements of an obstruction offense." Trump appeared to be in a celebratory mood, saying at a White House event with wounded US troops that he was "having a good day" following the report`s release, adding, "It`s called no collusion, no obstruction." 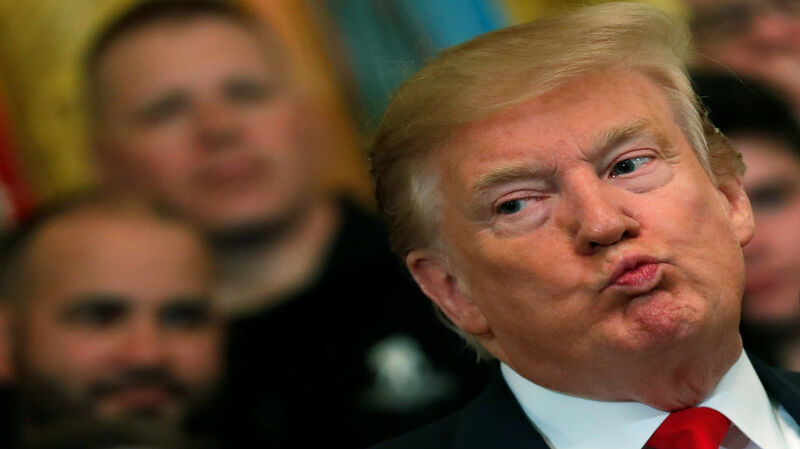 The report`s disclosure, with portions blacked out by Barr to protect some sensitive information, is certain to launch a new political fight in Congress and on the 2020 presidential campaign trail, as Trump seeks re-election in a deeply divided country. Trump has long described Mueller`s inquiry as a "witch hunt." The report stated that when Jeff Sessions, Barr`s predecessor as attorney general, told Trump in May 2017 that a special counsel was being appointed by the Justice Department to look into allegations that the Republican`s campaign colluded with Russia, Trump slumped back in his chair and said, "Oh my god. This is terrible. This is the end of my presidency. I`m f**ed." Some Democrats in the House of Representatives have spoken of launching impeachment proceedings against Trump in Congress but top Democrats have been notably cautious. Any such effort would be unlikely to be successful because Trump fellow Republicans controls the Senate, which would decide the president`s fate. The inquiry laid bare what the special counsel and US intelligence agencies have described as a Russian campaign of hacking and propaganda to sow discord in the United States, denigrate 2016 Democratic candidate Hillary Clinton and boost Trump, the Kremlin`s preferred candidate. Russia has denied election interference. In analyzing whether Trump obstructed justice, Mueller looked at a series of actions by Trump, including his attempts to remove Mueller and limit the scope of his probe and efforts to prevent the public from knowing about a June, 2016 meeting at Trump Tower in New York between senior campaign officials and Russians. In June 2017, Trump directed White House counsel Don McGahn to tell the then-acting attorney general that Mueller had conflicts of interest and must be removed, the report said. It also said there was "substantial evidence" that Trump fired James Comey as FBI director in 2017 due to his "unwillingness to publicly state that the president was not personally under investigation." Mueller cited "some evidence" suggesting Trump knew about former national security adviser Michael Flynn`s controversial calls with the Russian ambassador to the United States before Trump took office, but evidence was "inconclusive" and could not be used to establish intent to obstruct. The report said Trump directed former campaign manager Corey Lewandowski to ask former Attorney General Jeff Sessions to say the Russia investigation was "very unfair." Before the report`s release, Barr gave a news conference at the Justice Department as he sought to shape the narrative on the document`s findings. One of a handful of people to have seen the report before its release, Barr emphasized, as he had said last month, that Mueller did not conclude there was collusion between Trump`s campaign and Moscow. Barr seemed to offer cover for Trump`s actions by saying the report acknowledges that "there is substantial evidence to show that the president was frustrated and angered by a sincere belief that the investigation was undermining his presidency, propelled by his political opponents, and fueled by illegal leaks." Mueller`s team did not issue a subpoena to force Trump to give an interview to the special counsel because it would have created a "substantial delay" at a late stage in the investigation, the report said. It said Mueller accepted the longstanding Justice Department view that a sitting president cannot be indicted on criminal charges, while still recognizing that a president can be criminally investigated. The report also cited Mueller`s repeated efforts to convince Sessions to resume oversight of the probe after he had recused himself because of his own prior contacts with Russia`s ambassador to the United States. The report said the special counsel`s team determined there was a "reasonable argument" that the president`s son, Donald Trump Jr., violated campaign finance laws, but did not believe they could obtain a conviction. 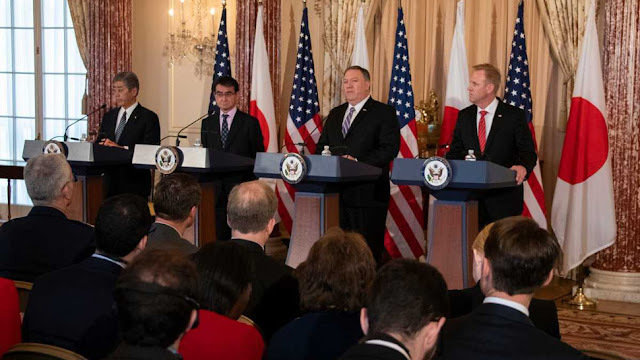 The US-Japan 2+2 dialogue includes US Secretary of State Mike Pompeo, Acting US Secretary of Defence Patrick Shanahan, Japanese Foreign Minister Taro Kono, and Japanese Defence Minister Takeshi Iwaya. The focus of the statements was to increase engagement in the Indo-Pacific region. While Japanese Defence minister Iwaya said his country will "make efforts to realize free and open Indo-Pacific", Japanese foreign minister said, "will make efforts to realize free and open Indo-Pacific". Acting US Secretary of Defence Patrick Shanahan said, 2+2 dialogue is a "testament to our commitment to a free and open Indo-Pacific". India, Japan, Australia, the US have been engaging on the Indo-Pacific. The US in 2018 changed the name of its largest naval commands--the Pacific command-- to Indo-Pacific Command to give a boost to the growing concept while India has set up a separate Indo-Pacific desk in its ministry of external affairs. Washington, along with Canberra has announced a number of the infrastructure project in the region. Prime Minister Narendra Modi, describing India's vision for Indo-Pacific at the Shangri La Dialogue in Singapore in 2018 said, for New Delhi, the concept stands for "Inclusiveness, openness & ASEAN centrality". ASEAN, The IORA groupings are currently discussing the concept. It can be incredibly frustrating to find yourself constantly burping. Whether it’s first thing in the morning, mid-morning, lunch, afternoon, dinner or bedtime, anytime you burp excessively seems like a bit too much. Especially when you’re being intimate with another, working closely with a partner or group at work, or on an important phone call. Before we dive into why you are burping a lot, let’s first clear the air. There are many people who feel they are burping “more than normal” but in reality they burp no more than every other person. Burping is natural part of being human. The foods and drink we consume create gas or we may swallow air in various ways. The air needs a way to escape. And our body releases it either through one end or the other. But if you do find that it seems to really be a bit more than normal, it’s good to take a look at the following reasons for excessive burping. Burping, or belching, can be mildly embarrassing and even more difficult to deal with if you hold it in. So why are you burping so much? Also known as gastroesophageal reflux disease (GERD), acid reflux occurs when the contents of our stomach backflow into the lower portion of your esophagus. It can make you burp. The burp is more like a liquid burp, and it can causes irritation of the esophageal lining. You can treat reflux with over-the-counter medications only when it occurs occasionally. Otherwise, you may need to make some major changes to your diet. Acid reflux is very often an indicator of food intolerance. Caffeine or foods high in fat, salt and sugar or processed foods can all cause acid reflux. An elimination diet can help you nail down exactly what foods and drinks are causing your excessive burping. The number one cause of stomach ulcer is a bacteria called H. pylori (Helicobactor pylori). You’ll need to visit your doctor to receive treatment to help remove this bacteria. If it goes untreated, it can cause serious health problems down the road. Indigestion is also known as dyspepsia. You may experience pain or discomfort in the upper portion of your stomach or belly area. Indigestion is common and it comes along with other symptoms like nausea and vomiting or bloating and cramps or even heartburn. IBS affects about 10-15 percent of the U.S. population, but most individuals remain undiagnosed. IBS can cause cramps, bloating, diarrhea or constipation along with excessive burping. Because the symptoms are so general, it can be easy to overlook. It’s usually not until IBS becomes severe that individuals seek help or remain undiagnosed. Your doctor will most likely use a combination of dietary changes and medication to manage your IBS. Finally, gastritis could be the source of your excessive belching. It’s a less common occurrence, but it’s a possibility nonetheless. Gastritis is the irritation of the lining of the stomach. You can experience a burning ache and pain, heartburn, indigestion, or easily feeling full in the upper portion of your stomach after eating. You may also vomit. If these symptoms persist or become worse, you’ll need to see a doctor for treatment. Burping is a normal bodily function, but excessive belching could be a sign of a larger problem. You need to visit your doctor if you feel you are consistently burping too much, especially in the setting of other symptoms. Before you dive into all the chocolate and candy promoted just about everywhere for the upcoming holiday weekend, you might want to think twice. That’s because a shocking new population-based study published in the United Kingdom found high levels of non-alcoholic fatty liver disease among youth and young adults, driven by obesity. Non-alcoholic fatty liver disease (NAFLD) is an umbrella-name given to liver conditions that are not linked to alcohol consumption. The main issue in fatty liver disease is that too much fat becomes stored in liver cells, which can cause inflammation and a host of other health problems. At its worst, it can cause cirrhosis or liver failure. In the United States, it is the most common form of chronic liver condition and is believed to affect 80 to 100 million people. Researchers from Bristol University studied over 4000 people as part of their research, calling it the Children of the 90s, following children born in 1991 and 1992 in Avon, England. At age 18, they were given ultrasounds which revealed that 2.5 percent had NAFLD. Five years later, another type of scan revealed that 20 percent of people had fatty deposits on the liver. Half of these people were classified as severe, with scarring on the liver. Severe liver scarring can cause cirrhosis of the liver. The findings were among primarily Caucasians with no symptoms of the disease other than being overweight. Sixty percent of the people with the largest number of fatty liver deposits were obese. While the study excluded people who drank heavily, drinking alcoholic beverages is one of the main risk factors for fatty liver disease. It is more commonly linked to older adults, believed to start among people in their 40s to 50s, mostly as a result of poor diet, obesity and type 2 diabetes. But, the new study found that even teenagers and twenty-somethings are at risk of non-alcoholic fatty liver disease. -Eat a healthy, plant-based diet replete with plentiful amounts of vegetables, legumes, nuts and seeds. -Restore a healthy weight—excess fat or obesity are the main reasons for fatty liver disease. Strive to restore or maintain a healthy body weight for protection from fatty liver disease. -Exercise regularly—you’ll need to make your workout cardiovascular in nature to reap the rewards and to help supply your liver with oxygen-rich blood. Of course, that doesn’t mean you can’t do weight training and other forms of activity, just be sure you’re raising your heart rate for at least 20 minutes 3 times weekly. But, don’t overdo either. You should be able to comfortably carry on a conversation. -Avoid drinking alcohol in excess, or better yet, drink only small amounts of alcohol on an infrequent basis. As I discuss in my video Higher Blood Pressure May Lead to Brain Shrinkage, one of the most consistent findings is that elevated levels of blood pressure in midlife, ages 40 through 60, is associated with elevated risk of cognitive impairment and Alzheimer’s dementia later in life—in fact, even more so than having the so-called Alzheimer’s gene. “The normal arterial tree”—all the blood vessels in the brain—“is…designed as both a conduit and cushion.” But when the artery walls become stiffened, the pressure from the pulse every time our heart pumps blood up into our brain can damage small vessels in our brain. This can cause “microbleeds” in our brain, which are frequently found in people with high blood pressure, even if they were never diagnosed with a stroke. These microbleeds may be “one of the important factors that cause cognitive impairments,” “perhaps not surprising[ly],” because on autopsy, “microbleeds may be associated with [brain] tissue necrosis,” meaning brain tissue death. And speaking of tissue death, high blood pressure is also associated with so-called lacunar infarcts, from the Latin word lacuna, meaning hole. These holes in our brain appear when little arteries get clogged in the brain and result in the death of a little round region of the brain. Up to a quarter of the elderly have these little mini-strokes, and most don’t even know it, so-called silent infarcts. But “no black holes in the brain are benign.” As you can see at 2:12 in my video, it’s as though your brain has been hole-punched. “Although silent infarcts, by definition, lack clinically overt stroke-like symptoms, they are associated with subtle deficits in physical and cognitive function that commonly go unnoticed.” What’s more, they can double the risk of dementia. That’s one of the ways high blood pressure is linked to dementia. There’s so much damage that high blood pressure levels can “lead to brain volume reduction,” literally a shrinkage of our brain, “specifically in the hippocampus,” the memory center of the brain. This helps explain how high blood pressure can be involved in the development of Alzheimer’s disease. As you can see at 3:02 in my video, we can actually visualize the little arteries in the back of our eyes using an ophthalmoscope, providing “a noninvasive window” to study the health of our intracranial arteries, the little vessels inside our head. Researchers “found a significant association” between visualized arterial disease and brain shrinkage on MRI. However, because that was a cross-sectional study, just a snapshot in time, you can’t prove cause and effect. What’s needed is a prospective study, following people over time. And that’s just what the researchers did. Over a ten-year period, those with visual signs of arterial disease were twice as likely to suffer a significant loss of brain tissue volume over time. “Sleep is one of the most important things we can all do at night to improve our health, our mood, our well-being, and our longevity,” says Rebecca Robbins, a postdoctoral research fellow in the Department of Population Health at NYU Langone Health. Which is kind of profound in its simplicity. While so many people are taking supplements and seeking all kinds of magic bullets for good health, one of the most obvious paths is a good night’s sleep. Alas, if only it were so easy – insomnia vexes the best of us. According to the CDC, more than 35 percent of Americans get less than seven hours of sleep per night. With this in mind, Robbins and other researchers from the NYU School of Medicine looked at more than 8,000 websites to suss out the 20 most common assumptions about sleep. Then, with a team of sleep medicine experts, they evaluated and ranked them based on whether each one could be debunked, or backed up by science. Here are some of the most common misconceptions that they addressed. Robbins says that this is a very common misconception, and was among the top myths they were able to dispel based on scientific research. Extensive evidence shows that consistently getting five hours of sleep or less greatly increases risk of adverse health consequence, like that of cardiovascular disease and early mortality. They say this myth poses the most serious risk to health from long-term sleep deficits. There’s a reason why there is something called a nightcap; many people think a drink before bed will help them have a good night’s sleep. Robbins says, nope – it’s a myth. A drink before bed may help someone fall asleep, but it dramatically affects quality of sleep. It pulls a sleeper out of REM and deeper sleep. You may still spend time sleeping, but you won’t be fully restored. A lot of people fall asleep in front of a tv in the bedroom, but watching television is not an optimal way to relax. Nightly news and other programming can lead to stress when we’re trying to power down and can lead to insomnia, says Robbins. These devices also emit bright blue light, which tells our brain to perk up, not sleep. Avoid blue light from tv and phones and instead do things that relax you. Many people think that if they’re having trouble falling asleep, it’s best to stay in bed and try. Unfortunately, if we stay in bed and keep trying unsuccessfully, we eventually associate our bed with insomnia. It should take about 15 minutes to fall asleep. If you’re waiting longer than that, get out of bed and change the environment – Robbins likens staying in bed wide awake to going to the gym and just standing on the treadmill. Instead, get up, do something mindless, like folding socks, and keep the lights low. Only return to bed when you feel tired. Another common myth suggests that snoring is harmless. Robbins says snoring can be harmless, but it can also be a sign of sleep apnea, a potentially serious sleep disorder. The researchers encourage patients not to ignore loud snoring. Instead, see a doctor to rule out sleep apnea since it may lead to heart stoppages or other illnesses. Curses. We are supposed to resist the lure of the snooze button? The researchers say yes. Most of us will be groggy from inertia when the alarm goes off, says Robbins, but forego the snooze button. Your body may go back to sleep, but it will be very light, low-quality sleep. Robbins suggests getting up and getting outside into the blue light of the day as quickly as possible. The experts say that when sleep is decreased, self-reported levels of sleepiness increase for the first several days before starting to plateau; but reduced sleep leads to sustained drops in performance. The study notes, “Further, nightshift workers, who habitually sleep fewer hours than day workers, face higher morbidity due to breast cancer and all-cause mortality than day workers.” So while people may be able to “adjust” to less sleep and/or “circadian misalignment,” they do so at the risk of serious health consequences. In the end, sleep is an important avenue for overall good health – and achieving it through good sleep habits is the way to go. Americans are expected to spend $52 billion on sleeping aids and remedies by 2020, but there are so many drawbacks to that approach that it seems prudent to start by debunking the myths and getting correct information out there. Robbins and her colleagues suggest creating a consistent sleep schedule and aiming for at least seven hours of sleep. I don’t know about you, but it looks like I will be folding some socks in the dark for a while. Alternatives for plain water are trending—but that doesn’t mean you should jump on the bandwagon for every new water craze. There’s everything from mineral water to alkaline water. This is what alkaline water really does to your body. Coconut water is another common and popular water variety, but is coconut water good for you? Here’s what science says so far about the benefits of coconut water. Coconut water is the clear liquid found in green coconut fruit centers, according to Caroline Apovian, MD, director of the Nutrition and Weight Management Center at the Boston Medical Center and professor at the Boston University School of Medicine. As the coconut ages and turns brown, the water solidifies turning into coconut meat. This coconut meat could become coconut milk, NPRreports. Asking, “is coconut water good for you” is a misnomer or kind of a trick question. Coconut water does have two main science-backed health benefits—it provides electrolytes like potassium and sodium, and it’s good for rehydration after physical activity or after illnesses that cause vomiting or diarrhea, says Ali Webster, PhD, RD, the Associate Director of Nutrition Communications for the International Food Information Council Foundation. Still, there is very little human research on the benefits of coconut water over plain, run-of-the-mill H20. One study in Medicine and Science in Sports and Exercise reported that coconut water replaced bodily fluids as efficiently as sports drinks and only slightly better than water. The athletes, however, preferred the taste of sports drinks—meaning you have to like the taste of coconut water to reap the benefits. Although it’s an acquired taste, if you do want something healthier than a sports drink, coconut water could still be a good albeit unnecessary option. Most people aren’t professional athletes and don’t exercise long or intensely enough to really need the extra electrolytes from coconut water, Webster says. That’s why Dr. Apovian says it doesn’t replace her regular water intake because she doesn’t want the extra calories. Even though coconut water has less sugar than some of the unhealthiest things at the supermarket like regular soda or juices, the calories still add up, Dr. Apovian says. As for the benefits, there’s also plenty of other ways to get potassium from foods such as potatoes, bananas, beans, spinach, and legumes, Webster says. “These foods provide other beneficial nutrients that coconut water doesn’t, like fiber and other vitamins and minerals,” she says. Is coconut water good for you? It could be a healthier alternative for other non-water beverages. For example, Dr. Apovian doesn’t drink alcohol and instead uses coconut water—like this one—to make tasty mocktails. “When I’m looking to relax on my own or with friends, I like to mix coconut water, pomegranate juice, or small amounts of tart cherry juice, and something fizzy like sparkling water,” she says. So feel free to dip your toes into this trend, and note that there are only a few potential benefits of coconut water.